And there’s more, but I’ll quit because I have a new kid on the More Time green bean block. This summer, my new gluten-free, and easily vegan or vegetarian green bean love takes the place of both potato salad (oh the time, calories, and fat) and three-bean salad thrown together with bottled Italian dressing. (Insert grimace.) A quick all-in-one side for Father’s Day (or any day) burgers, grilled chicken, ribs, steaks, or pork chops, it’s also pretty much a one-pot wonder. (Less dishes to wash.) When I think of it, my new green bean and potato dish feels more like a new school riff on the old southern mess of green beans with potatoes my mom and maybe yours liked to cook when both the beans and new potatoes were ready at the same time in garden. Leftovers? Right! They make for a healthy lunch all on their own, too–which is a happy thing this time of year when we want to be outside gardening, hiking, or at the picnic table drinking a cold one–and not at the stove. I happened to have leftover bacon and toasted walnuts and threw them in; leave them out if you don’t have them. Hot? You could make this in the cool morning and refrigerate it until dinner time. No basil? Use tarragon as I did the second time I tested this. LEFTOVER HINT: I took the leftovers and stirred in sliced kalamata olives and chopped fresh mozzarella along with a few more tomatoes for the next day’s lunch. YES! VEGANS: Skip the bacon and added cheese in leftover versions. VEGETARIANS: Skip bacon and make sure to use fresh mozzarella for leftover version. COOK THE POTATOES: Fill an eight or ten-quart pot 3/4 full of water and add 1/2 teaspoon each salt and pepper, along with a pinch of crushed red pepper and the stem from the basil. Cover; bring to boil. Add potatoes and cook until tender, 5 – 10 minutes. Meanwhile, chop the basil leaves and set aside for a moment. Using a spider or spatula, remove the potatoes to a large mixing bowl, leaving hot water in pot to cook green beans. Add shallots and chopped basil to the potatoes in the bowl and season with a good pinch of salt and pepper and a drizzle of olive oil; stir and set aside. 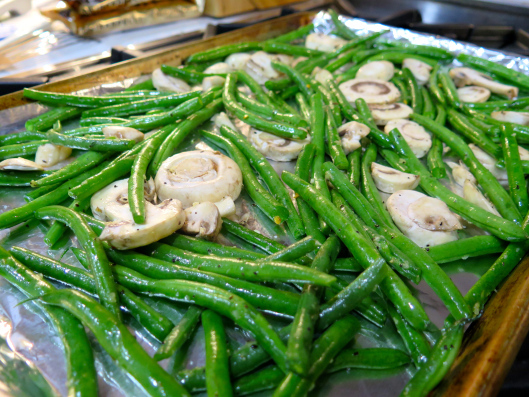 COOK THE GREEN BEANS IN THE SAME WATER: Add green beans to the pot of water and cook until tender, 4 – 5 minutes. (Depends on how thick your beans and how old they are, as well as where you live. Here at altitude, it probably takes me a couple of minutes longer.) Drain well. Remove basil stem. STIR IT ALL TOGETHER, RE-SEASON, AND SERVE: Add drained beans to the mixing bowl with the potato mixture; sprinkle with salt and pepper and a tiny bit of crushed red pepper. Stir gently, but well. Add bacon, walnuts, red wine vinegar, mustard, and 2 more tablespoons extra virgin olive oil. Stir well once more and taste. Adjust seasonings, including salt, pepper, vinegar, and oil. Tip onto a serving platter or bowl. Top with sliced cherry tomatoes. Serve hot, warm, at room temperature, or cold. COOK’S NOTE: Why are there ranges for amounts of ingredients in my recipes? Or ranges for cooking times? 2. RANGES FOR COOKING TIMES: Your stove, pot, heating elements, altitude, etc could all be different than mine. Your idea of “low heat” might not be the same as anyone else’s. Your vegetables could be larger, smaller, older, newer, or cut into different size pieces than in my kitchen. You might like your potatoes more tender than do I. All of these elements count in the kitchen, which is why a recipe is only a guideline, an idea, and you create your meal to your own tastes. (There’s no option.) I’m always amazed and also happy to see the differences when readers send me pictures of the meals they’ve made from my recipes. Cooking must be a creative process. or, just for fun, listen to the famous Greens, Beans, Potatoes, Tomatoes song (Shirley Caesar) with the Peanuts Gang dancing. There’s definitely a song for almost anything.